Hello everyone, I've been extremely busy lately with work and just the general shenanigans of everyday life that I simply had to put a little hold my favourite thing ever & that is of course blogging. 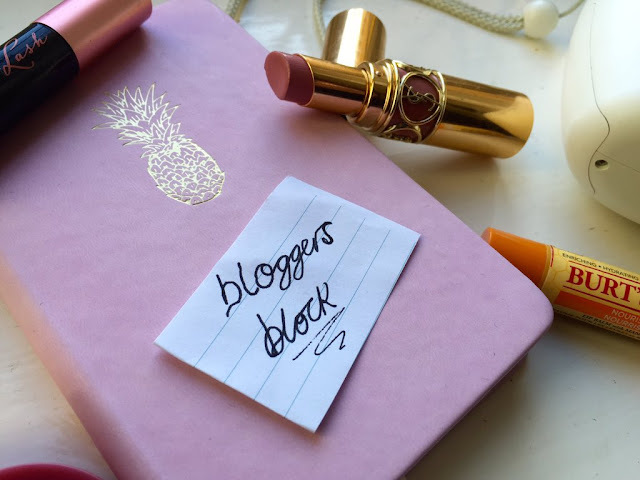 Which has now led me to writing this post, 'Bloggers Block' as I like to call it, Is something I feel everyone whether you are a blogger or author or have anything to do with writing in some way, will at some point suffer with a bit of a block. It's something that always annoys me and I feel like I worry to much about getting 'Bloggers Block' when in reality I really probably shouldn't. So today I wanted to share with you some tips/'advice' to kick 'Bloggers Block' in the backside hahaha ;). Buy a little note book - I recently went on another trip to Homesense (I know I can't keep away from that shop) and made my way to the stationery section, I love looking and finding cute little notebooks, and I bought many including this little baby pink pineapple one. One of the best pieces of advice I could give someone is buy a little tiny notebook, that you can chuck in your handbag or simply have at your bedside table. I've been keeping all my 'future blog post' ideas inside and honestly it give me SO much inspiration and helps me plan lots of exciting new things. 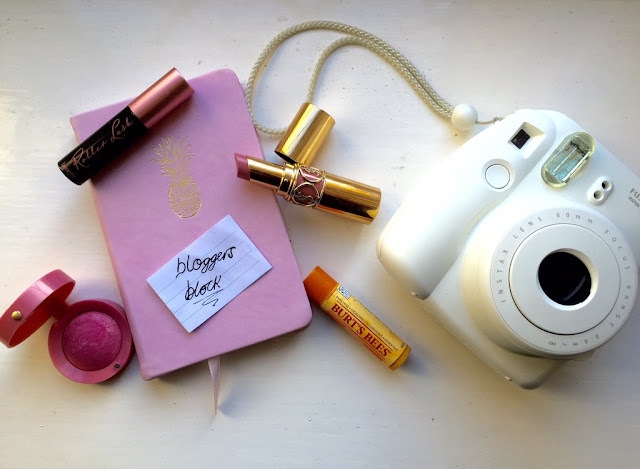 Bloglovin' - Bloglovin' is one of the main ways I read (and follow) my favourite blogs, and it gives me SO many ideas that I end up filling half of my little pineapple book, you can read anything from new beauty products (one of my many favourite types of posts) to the latest ootd (yes I'm on about the gorg Liv from What Olivia Did, my favourite blogger EVER, be sure to check her blog out guys) you can find a little bit of everything to kick start the inner creativity inside you. Tumblr - I have a Tumblr page (feel free to follow me if you'd like, but be aware it will be filled with all things copper and harry styles related) and I love nothing more than scrolling through my feed, liking and re-blogging photos or GIFS, tumblr is a must for me as it helps me feel creative and makes me want to get blogging haha. Get Out - I hate being indoors I'm more of an out and about person, so I love nothing more than heading to the shops, one of my many favourite things is going to meadowhall, it's got every shop I could possibly want to go in, and makes me spend some moolah. I like going out because it makes me feel inspired or it makes me want to go out and swatch (maybe even purchase) that lipstick I heard someone raving about on bloglovin'. 'Bloggers Block' is something most people will have experienced at somepoint, so don't worry about it, chill, go for a walk (to boots hehehe ;) ), buy a little pineapple notebook and remind yourself why you started blogging in the first place, I started blogging because I wanted to share with the interwebs the things I liked and recommended as well as something that I thought other people could relate too. 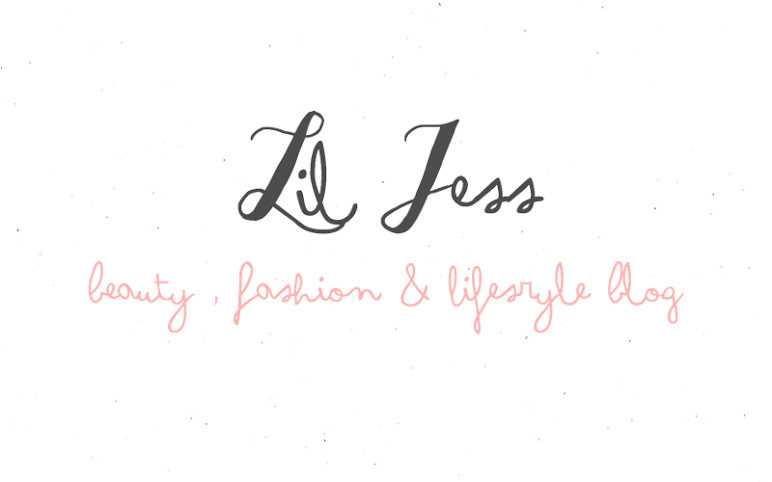 It makes me SO happy blogging away in my bedroom, and It's a hobbie (probably one of my favourites), it's something that should be enjoyed. so when you next are hit back, pick yourself up and smile. I hope this post helps you in someway and that you liked it, let me know in the comments how you beat 'bloggers block' and if it has effected you. Do you or have you suffered from 'Bloggers Block? 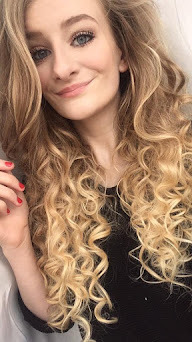 I get it all the time, I just find now that blogging when I actually have something to write about is the best way for me now, I actually started to not like blogging because I was doing it for all the wrong reasons but I love it again now! Blogging is something that should make you happy not feel like a chore.